The inner part of symphysis menti possesses four tubercles known as genial tubercles or mental spines set into two pairs: upper and lower. The upper pair connects with genioglossus muscles and lower pair connects with geniohyoid muscles. Mylohyoid line runs obliquely anterior and inferior, behind the 3rd molar tooth which is nearly 1 cm inferior to the alveolar border towards the symphysis menti below the genial tubercles. 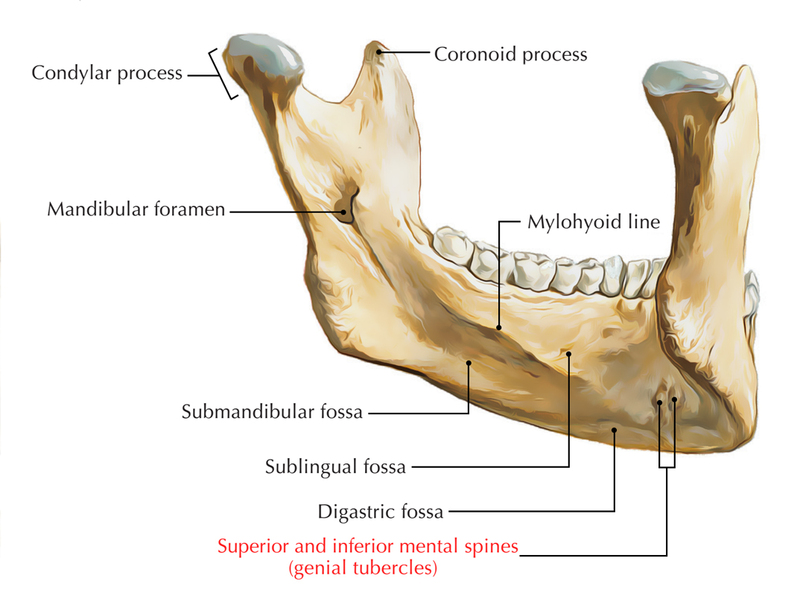 Geniohyoid Muscle originates from inferior genial tubercle. Genioglossus Muscle originates from superior genial tubercle.